I have to look through all my photographs to see what I have been up to! I recently attended my annual quilt retreat with friends from back home. We actually stay in a quilt shop that has bedrooms upstairs. Here is the motley crew of five of us….this is for you, Robin! We missed you. I have lots to blog about because lots has been happening. Last week I went on a quilt retreat. I didn’t quilt very much because I usually do artsy things. Do you receive the Cloth Paper Scissors Today email in your inbox? Well, you should. 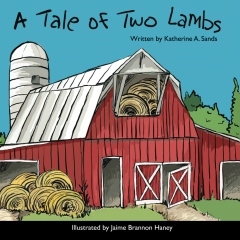 I got one last week with a project from Pam Carriker. She has just come out with a new book called Art At The Speed Of Life. I was interested in doing the project on my retreat. And especially since I have just finished a 4 week online course with Pam. 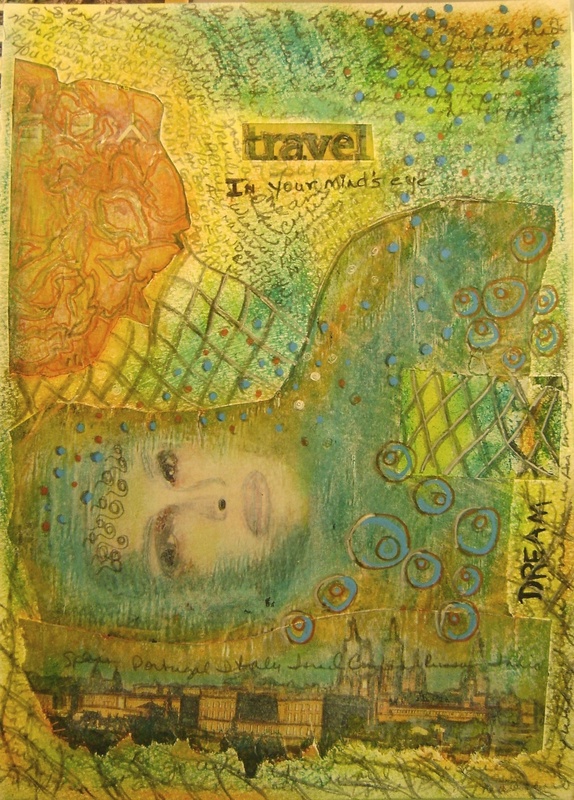 This journal page started out using some pictures cut from magazines. Then I began to draw over them with graphite pencil, adding color with oil pastels since I didn’t have any liquid paint with me. I used poster paint markers and other pens to finish. Not the greatest, but not too bad for the first try, I think. I also used some techniques and ideas from the journaling class. Here are Susan and Robin from the retreat in our basement workspace. They kept a secret from me for about 3 months…the secret was that Robin, who now lives in North Carolina, would be joining us. I was SO glad she got to come. It was very good to see her again. 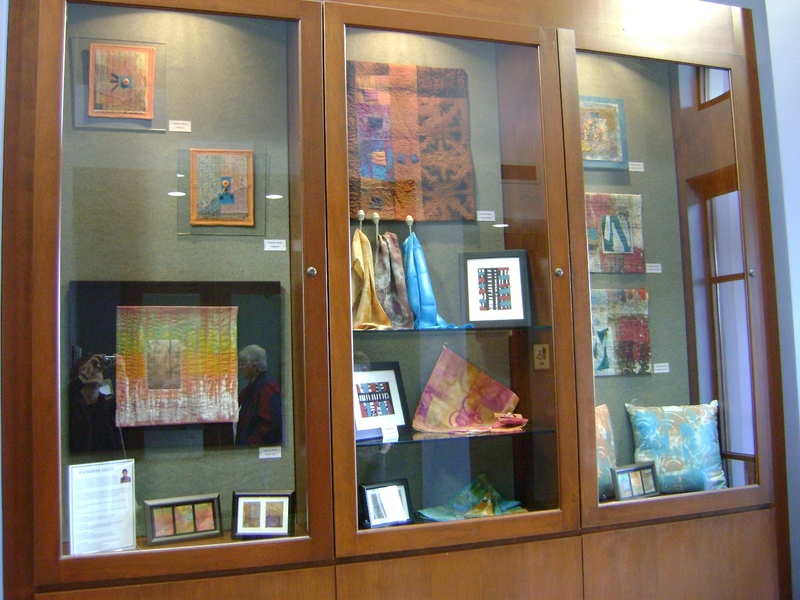 Yesterday, I hung an exhibit at the North Park Library in Evansville. It is on Koehler Drive off of First Avenue. 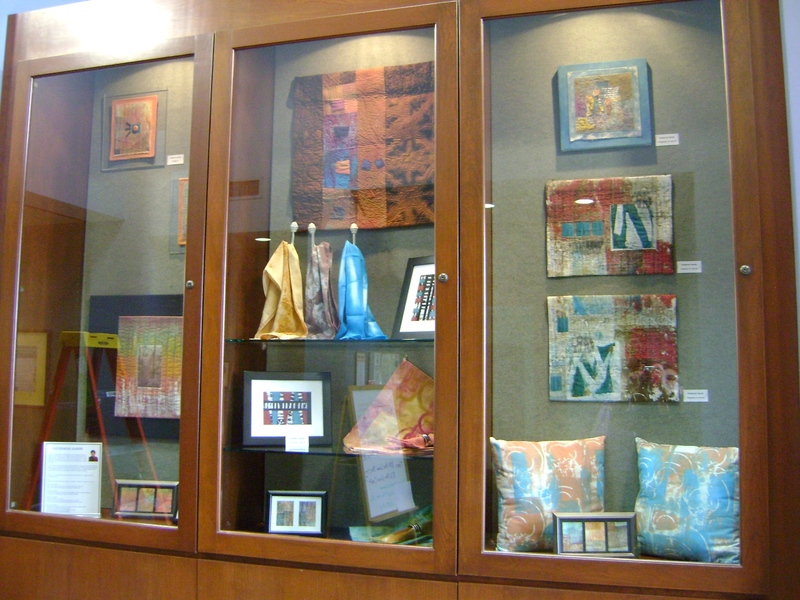 Stop by and see it…I think it looks pretty nice! Well, I’m back at home this week and getting the rest I missed getting (!) at retreat. 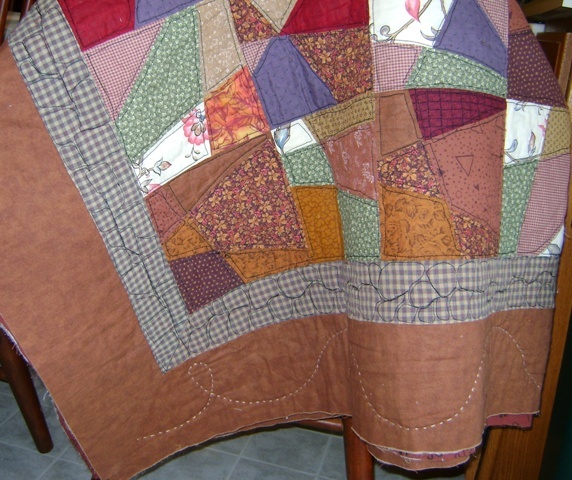 I got the quilt finished and put the binding on (see photo from prior post). I got a new jacket model finished. I finished stitching up 5 new bags. Here are a couple of them. These two are now posted in my etsy shop. 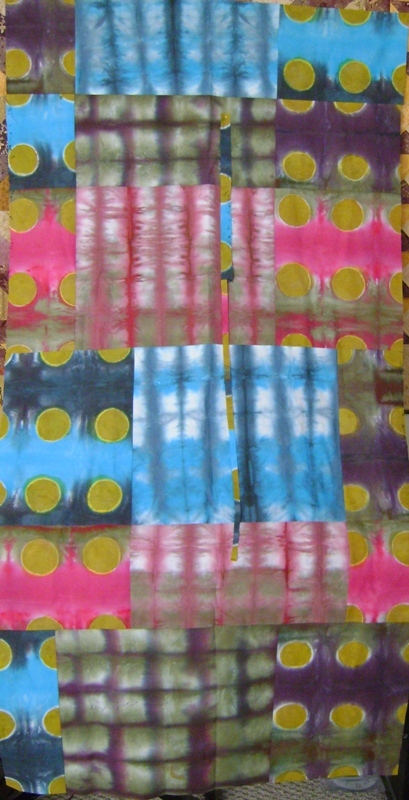 I had taken some layered cloth for backgrounds for new art that I did the machine quilting on. 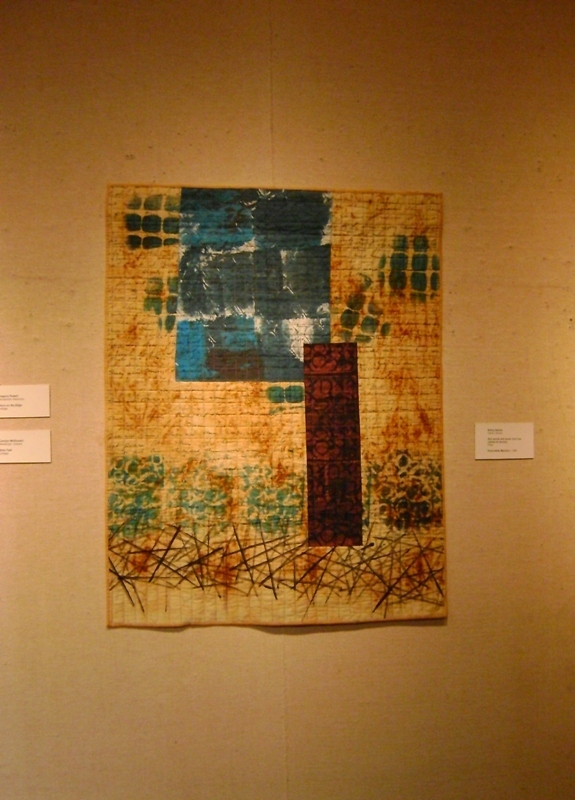 These are pieces in a series like “Flow” on my sidebar. Getting away from home is helpful…like…a quilting marathon…no cooking, no cleaning, no laundry, just sewing and quilting. Everyone should do it once in a while! Yesterday was spent in an endless round of picture taking while I tried to get good photos for jurying. I used the shots taken in the photographer’s studio as a gauge, since this particular piece didn’t get photographed there. Now I think I’m finally done with that process! Getting ready for Indiana Heritage show in Bloomington, IN. Planning, preparation and putting in orders. It will be a bigger show than I usually do…but that will be good. I am gathering projects together and preparing to leave for retreat with my friends from back home. This has become an annual event and is now our 4th? or 5th? Can’t quite remember! 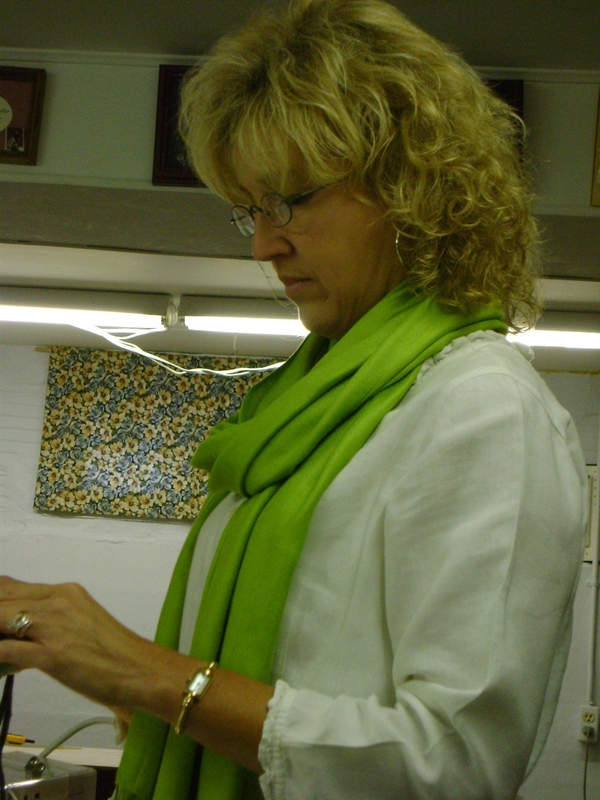 All I know is we hang out and sew and quilt for 2 1/2 days at a quilt shop. I can get LOTS done when I am away from home and routine and can just concentrate on my projects. I usually try to take things that need to be finished that have just been sitting here like…a stack and slash crazy quilt. The top was made in 1999 when I first joined guild, then I finally got it quilted (I may have finished the machine quilting at last year’s retreat). Now I will complete some hand quilting with perle cotton in the outer border, put the binding on and it will be finished! Yeh! I have fabrics printed and layered to make more little bags, so I plan to finish those. 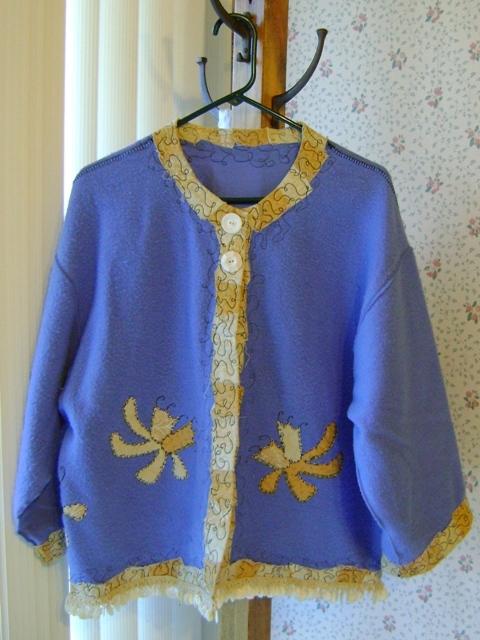 I am working on a new little jacket by SuznQuilts to sell patterns from at quilt shows. 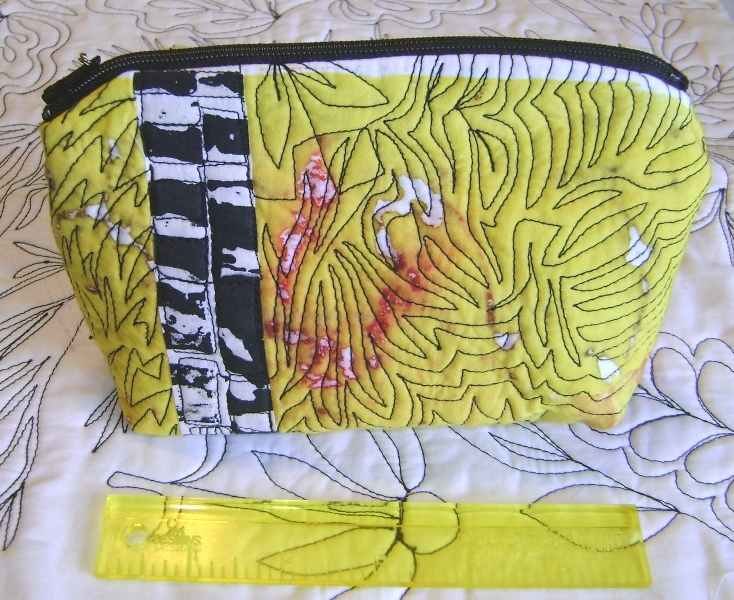 In 2011 I have my first solo show, so I have some small pieces layered and ready to stitch…nothing like starting early! I am looking forward to a fun time with friends and getting projects finished. A late afternoon photo, front yard. A sunny photo, back yard. Thank the Lord we never lost power with two different sets of freezing rain and ice with 4-6 inches of snow in between. Other states have had it worse, I feel for them. I got lots done even with a husband home from work. I finished that pesky “possible” commission proposal yesterday….yea!!! This past weekend while I was out of town at another quilt retreat, I felt a nudge inside to….go for it!! Make the effort and do it. 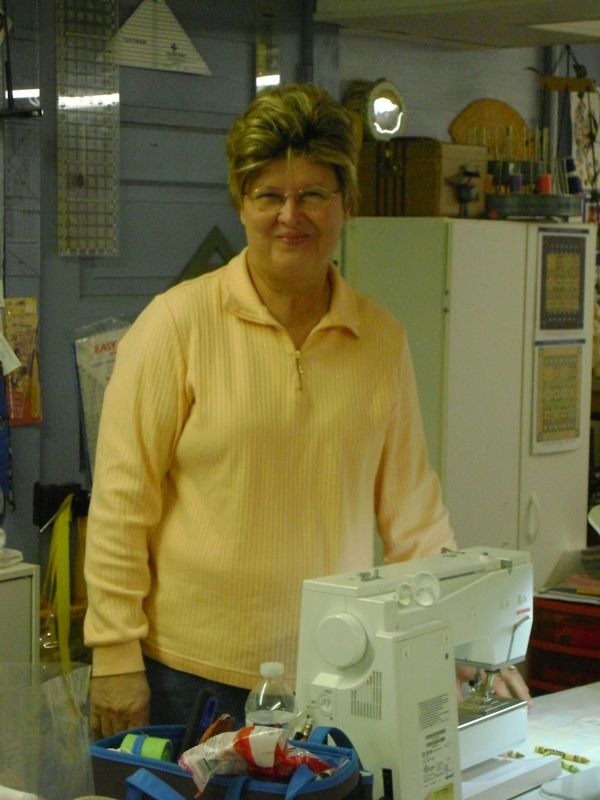 We spent three days at Rosemary’s quilt shop in Highland, IL. 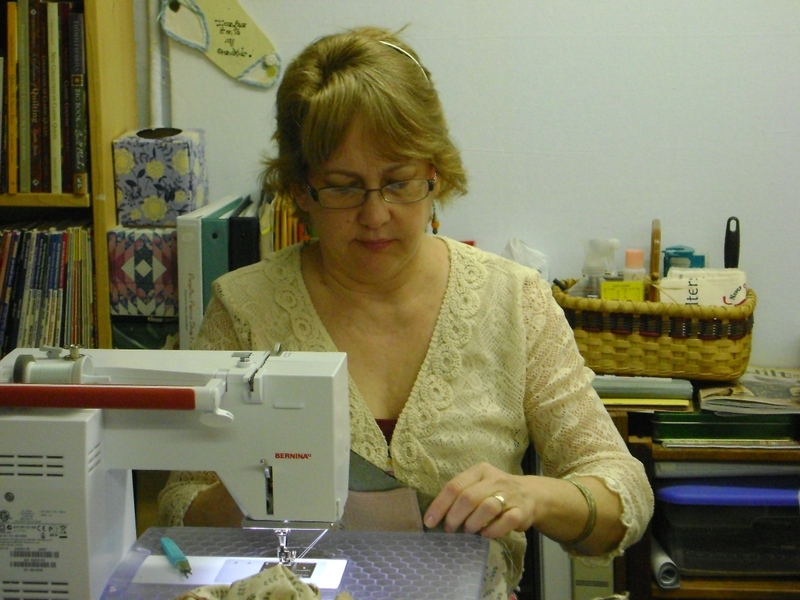 When the phone rang and someone asked, what are you doing, the classic answer was, sewing! I spent Thursday afternoon/evening finishing up entries for the Renewed, Repurposed, Reborn exhibit at Rend Lake, then Friday was spent making bag samples for my booth for shows (that was work). Saturday morning as I sat there quilting (doing something exciting for a change) on my stack and slash crazy quilt (pieced in 1999), with a cup of coffee and quilting friends, I decided that this, indeed, was the perfect morning. My husband purchased a weekend quilting retreat for me for Christmas/birthday. I had a wonderful weekend! 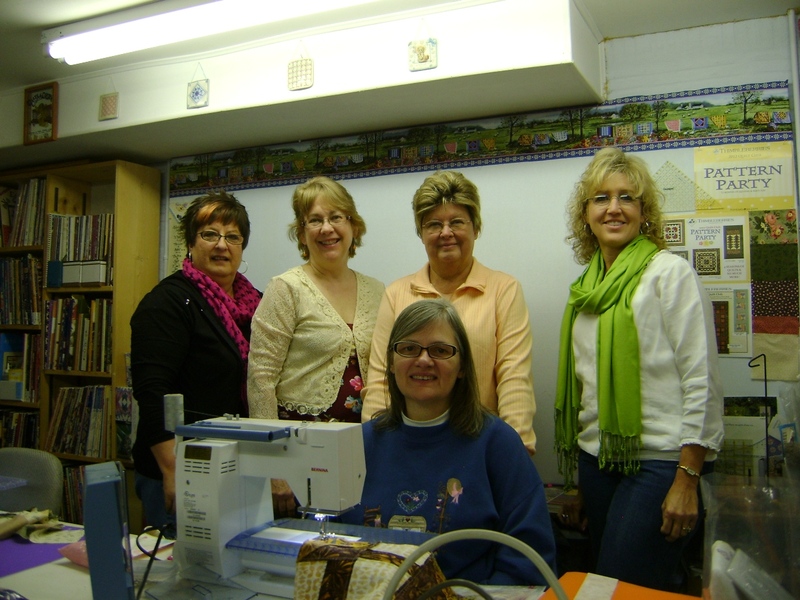 The retreat was put on by The Village Mercantile quilt shop in Boonville. This is a huge store run by Betty Cummings (who just happens to be my friend and sometimes roommate at shows). Her husband Steve used to run Victoria’s Tea Room above the Mercantile. Steve loves to cook and he is quite good at it. Anyway, the two of them put on this quilting shindig at a campground in Newburgh, IN. 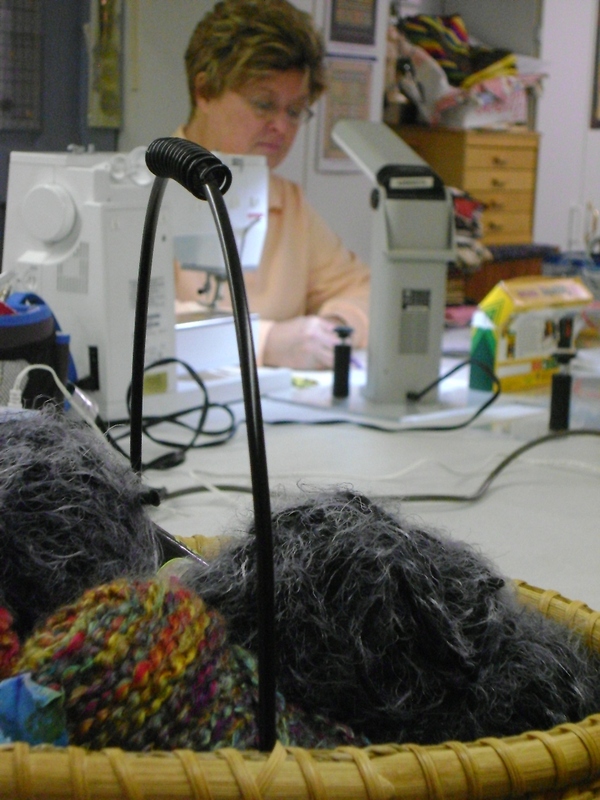 For anyone not familiar with what a quilting retreat is, I will give you the low-down. We arrived on Friday by 3 p.m., except for those eastern Indiana people who live in the next time zone…they got there early. Set up and start sewing. I think dinner was at 5:30 or so. Steve’s tomato pie and broccoli salad…awesome. And there was dessert….Italian Creme cake (also awesome) and Chocolate Chocolate cake (I didn’t get to try it). Then more sewing. We slept in a dormitory with bunk beds. It’s hard sleeping with 16 other people, but Betty had supplied everyone with earplugs. How thoughtful! She really took care of us. There were bags on our beds with shampoo, bar of soap, a bandaid, some other odds and ends and a candy bar. Then a trip to the Mercantile that evening. More sewing, as late as you want. Sunday morning breakfast was odds and ends of muffins, biscuits and apple butter, coffee and juice, cereal, and more sewing. Lunch, and then a bit more sewing before packing up for home. I made some wonderful new friends from eastern Indiana. They were loads of fun and I am glad Betty assigned me to their table. At the end of it all, I remarked to Betty that there was not a man on the planet who had managed to satisfy so many women in such a short time…I was referring to her Steve and his cooking. I think I will be doing this again. I even got a couple of projects completed. 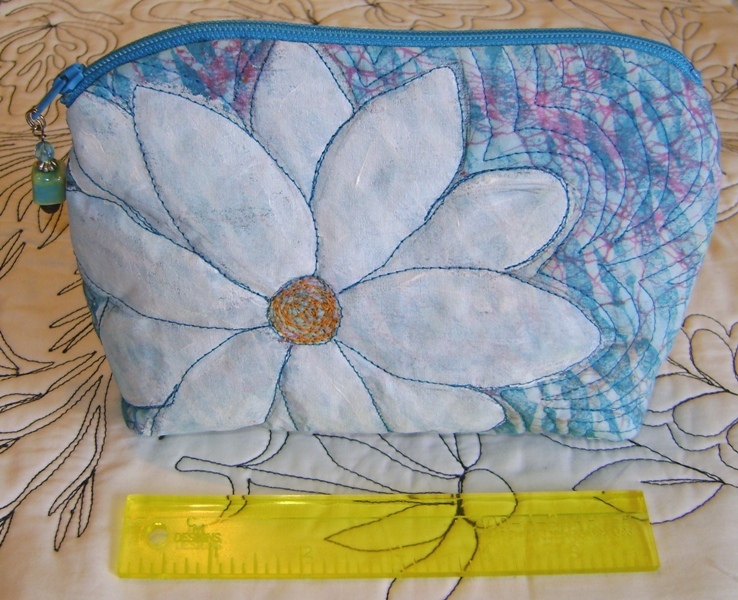 The large Bossa Nova Bag by Cedar Canyon Textiles in, what else?….hand dyed fabrics. 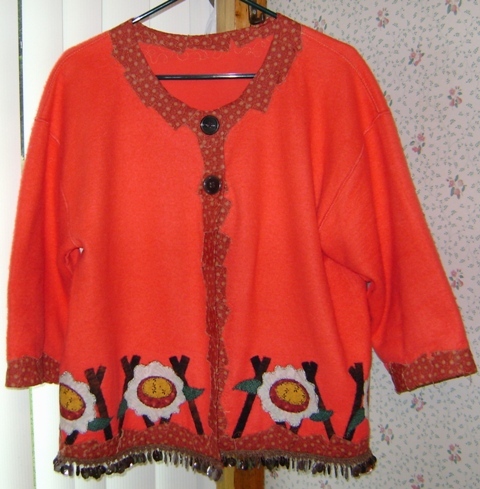 I also completed a sweatshirt jacket in a Valentine’s day theme. Picture of that to come later. Then…because I never received my Quilting Arts magazine for December, Pokey promised me an issue PLUS some of her fun fabrics. Yea for me! And thanks, Pokey, for being so sweet. The package was waiting for me when I arrived home. Ahhh……life is good.